Instead of studying and learning from every bug, you can save a lot of time by counting and aggregating bug reports. That’s a good thing in its way, because if you don’t study and learn from every bug, you’ll need all the time you can get to deal with problems that seem to keep happening over and over again. When someone says “We don’t have time for testing”, try translating that into “We don’t have time to think critically about the product, to experiment with it, and to learn about ways in which it might fail.” Then ask if people feel okay about that. Where Does All That Time Go? “How much time do you spend on this kind of stuff each week?” I asked. Wow, I thought—that’s a pretty good chunk of the week. I had an idea. 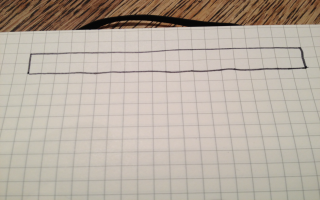 “Let’s visualize this, I said.” I took out my trusty Moleskine notebook. 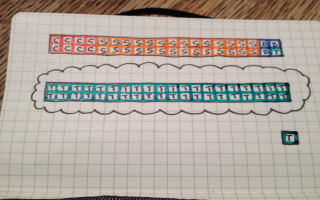 I prefer the version with the graph paper in it, for occasions just like this one. 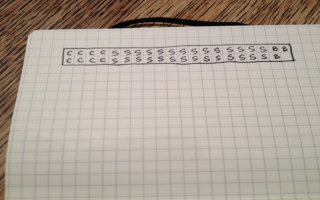 I outlined a grid, 20 squares across by two down. “So you spend, on average, an hour and a half each day on compliance stuff. One-point-five times five, or 7.5 hours a week. Let’s make it eight. Put a C in eight squares.” He did that. 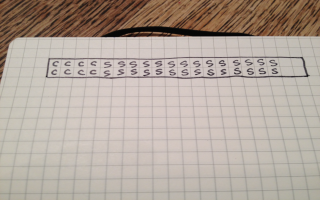 Whereupon Pedro proceded to fill in squares. Ten of them. Ten more. And then, eight more. “Yes. In session-based test management, that’s bug investigation and reporting—B-time. And it does interrupt test design and execution—T-time—which is what produces actual test coverage, learning about what’s actually going on in the product. So, how much B-time?” He filled in three of the squares with Bs. He had room left to put in one lonely little T in the lower right corner. “I’ve mentioned it,” he said. “What do you mean?” Pedro asked. “So since you’re a tester, and since the door on the test lab says ‘Test Lab’, and your business card says ‘Testing’, they figure that’s all you do. The illusion is what Jerry Weinberg calls the Lumping Problem. All of those different activities—administrative compliance, setup, bug investigation and reporting, and test design and execution—are lumped into a single idea for them.” And I drew it for him. “When in fact, what they’re getting from you is this.” And I drew it for him. “Seven times the test coverage if they get some of those issues worked out, then,” said James. “Maybe de-lumping is the kind of thing lots of testers would want to do in their test reports,” I said. Over the last few years, people have become increasingly enthusiastic about the idea of mind mapping to help them describe or illustrate or otherwise consider test coverage. For me, Darren McMillan was the one who really got the ball rolling here, here, and here. More recently there have been other examples to present coverage ideas. Colleague Adam Goucher has weighed in here. But there’s another thing you can do, something that James Bach and I have been talking about in the Rapid Software Testing class for a couple of years now: You can use a mind map to help decide about how might allocate your time when you’re dealing with an uncertain situation. You can do this with a functional or structural diagram, too. Let’s try this with an example. There is a given number of hours in a typical week; let’s say 40. There are some testers on the team; let’s say four. Each tester can accomplish a certain amount of uninterrupted testing time in the course of a day. For this exercise, let’s say that it’s three 90-minute sessions per tester per day. That means that each tester could accomplish 15 sessions per week, so our team of four could pull off 60 sessions per week. Now, most sessions are not entirely productive in terms of test coverage. That is, sessions are not typically dedicated entirely to on-charter test design and execution (that’s called that testing time or T time in session-based test management). T-time is regularly interrupted by other activities. Apart from test-design and execution, whereby we obtain test coverage, there’s usually some setup time (S-time), and there’s almost always some bug investigation and reporting time (B-time). We can’t predict how well any given session is going to go, but over time we can learn to develop a sort of first-order, back-of-the-envelope, finger-in-the-air, heuristic, probably-wrong-but-right-enough kind of guess. We are talking about predicting the future, here. Let’s say that between them, our general experience with this development group is that B-time and S-time tend to cost us about a third of our time as we’re testing. So, in order to figure out how we’re going to spend our time this week, we can’t say that we’re going to get 60 sessions worth of test coverage. Our effective testing time is more like 40 idealized sessions. Let’s represent those sessions with sticky notes—one perfectly session per note. For the team we’re imagining here, we’d have 40 sticky notes to work with. Different sessions usually have different themes—tasks, activities, or approaches. As we engage with a brand-new feature, we might perform an “intake” or “survey” or “reconnaissance” session, with the goal of identifying what’s there to be tested. “Analysis” sessions might help us to decide on where certain risks are, what we want to cover, or how we want to cover it. As we get deeper into the testing of a particular feature (“deep coverage” sessions), we might want a given session to be focused on a particular kind of test coverage—straightforward capability testing, data- or domain-focused testing, or testing on a specific platform. Maybe we want to cover a feature of the product while focusing on a particular parafunctional quality criterion, like performance or usability. Perhaps we want to allocate some sessions to design or coding of test oracles. Maybe we could dedicate a session or two to exploring the product based on problem reports from the help desk. If we’d like to highlight specific dimensions of activities or coverage, we can decorate our sticky notes with icons, one or two key words, or a dot——or we can use different colours for the notes, or some combination of these things. 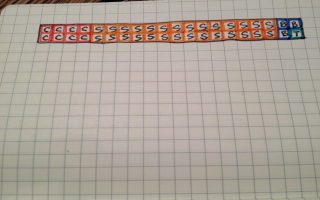 In this example, we’ll use little icons to represent classes of activities. Now get the team together in front of a whiteboard or flip chart to look at your structural diagram, flowchart, or mind map. Place a sticky note (perhaps with a few words of explanatory text) on each node (functional area) or line (interface) on the map you’d like to cover with an idealized session. Keep putting sticky notes on the diagram until you’ve used them up. By the time you’re out of sticky notes, you will have begun to develop some ideas about what you might or might not be able to accomplish given a week to do it. Are some areas not covered at all? Pick up a sticky note from somewhere else, and move it around. Should certain risky or complex areas receive more attention than others? If so, they might be worthy of more nodes and more than one sticky note. Not enough sticky notes—that is, not enough time, given the people you have available—to cover the whole diagram as well as you’d like? In that case, something has to change, but if all the assumptions above still hold, the catch is that you only have 40 sticky notes to work with and to redeploy. There’s another catch, too. Diagrams are models. Models are simplifications of reality, and so they leave stuff out. 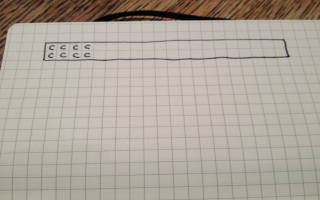 In this kind of exercise, things that don’t appear on your diagrams can be easy to forget. 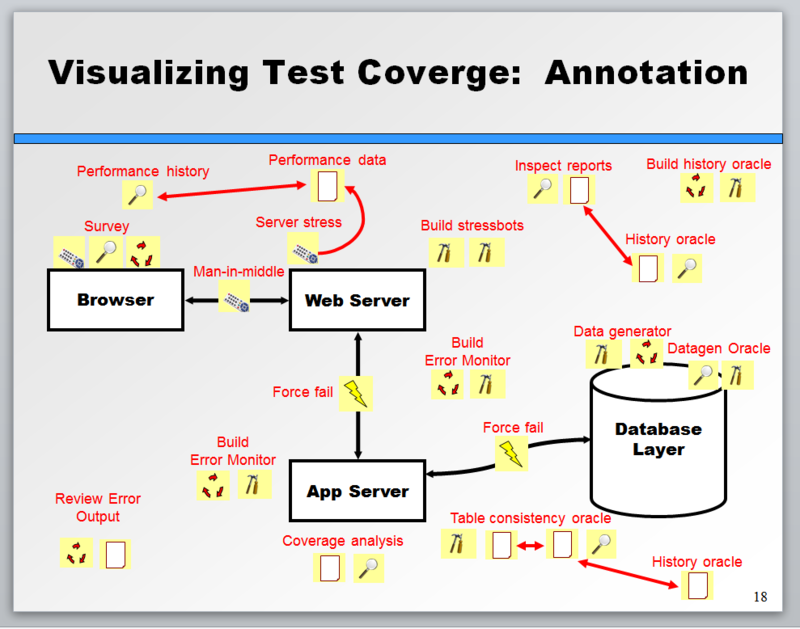 Some essential aspects of test coverage might not fit very well on the diagram, or indeed on any diagram. As you notice missing items or missing ideas, put them on the diagram or on a list in one corner of the space. Keep asking what might be missing from the diagram or the list. Each element on the list is a potential candidate for its own sticky note—or maybe you can cover two or three list items within a single session. Once the diagram has been covered with general ideas, we can choose to write a more specific and refined charter for each sticky note. Maybe our sessions won’t be as productive as we thought. If, in the course of testing, we determine that our assumptions aren’t meshing well with reality, we can revisit the diagram and the sticky notes to re-evaluate as soon as we have any information that might threaten the schedule or the anticipated test coverage. We’d typically look at a new diagram, or look at an old diagram in a very different way, every week or two in any case. This approach could be adapted to mesh very well with the ideas that Paul Holland outlines in this article. Making things visible provides a point of departure for conversations about strategy, logistics, and timing. It’s important for us to have the skill of telling a story about what there is to test, how we could test it, what we could cover, and what our constraints might be. Some simple visual aids can help us to illustrate that story. We were in the middle of a testing exercise at the Amplifying Your Effectiveness conference in 2005. I was assisting James Bach in a workshop that he was leading on testing. He presented the group with a mysterious application written by James Lyndsay—an early version of one of the Black Box Test Machines. “How many test cases would you need to test this application?” he asked. Jerry looked at the screen for a moment. “Three,” he said, firmly and decisively. In yesterday’s post, I was harshly critical of pass vs. fail ratios, a very problematic yet startlingly common way of estimating the state of the product and the project. When I point out the mischief of pass vs. fail ratios, some people object. “In the real world,” they say, “we have to report pass vs. fail ratios to our managers, because that’s what they want.” Yet bogus reporting is antithetical to the “real world”. Pass vs. fail ratios come from the the fake world, a world where numbers have magical properties to soothe troubled and uncertain souls. Still, there’s no question that managers want something. It’s our mandate to give them something of value. Some people say that managers want numbers because they want to know that we’re measuring. I’ve found two ways of thinking about measurement that have been very useful to me. One is the definition from Kaner and Bond’s splendid paper “Software Engineering Metrics: What Do They Measure and How Do We Know?”: “Measurement is the empirical, objective assignment of numbers, according to a rule derived from a model or theory, to attributes of objects or events with the intent of describing them.” I think that’s a superb definition of quantitative measurement, and the paper includes a set of probing questions to test the validity of a quantitative measurement. Pass vs. fail ratios fall down badly when they’re subjected to those tests. Jerry Weinberg offers another definition of measurement that I think is more in line with what managers really want: “Measurement is the art and science of making reliable (and significant) observations.” (The main part of the definition comes from Quality Software Management, Vol. 2: First-Order Measurement; the parenthetical comes from recent correspondence over Twitter.) That’s a more general, inclusive definition. It incorporates Kaner and Bond’s notion of quantitative measurement, but it’s more welcoming to qualitative, first-order approaches. First-order measurement, as Jerry describes it, provides answers to questions like “What seems to be happening? and What should I do now?” It entails a minimum of fuss, and tends to be direct, unobtrusive, inexpensive, and qualitative, leading either to immediate action or a decision to seek more information. It’s a common, misleading, and often expensive mistake in software development to leap over first-order measurement and reporting in favour of second-order—less direct, more quantified, more abstract, and based on more elaborate and vulnerable models. My experience, as a tester, a programmer, a program manager, and a consultant, tells me that to manage a project well, you need a good deal of immediate and significant information. “Immediate” here doesn’t only mean timely; it also means unmediated, without a bunch of stuff getting in between you and the observation. In particular, managers need to know about problems that threaten the value of the product and the on-time, successful completion of the project. That knowledge requires more than abstract data; it requires information. So, as testers, how can we inform the decision-makers? In our Rapid Software Testing class, James Bach and I have lately taken to emphasizing this: We must learn to describe and report on the product, our testing, and the quality of our testing. This involves constructing, editing, narrating, and justifying a story in three lines that weave around each other like a braid. Each line, or level, is its own story. Level 1: Tell the product story. The product story is a qualitative report on how the product can work, how it fails, and how it might fail in ways that matter to our clients. “Working”, “failure”, and “what matters” are all qualitative evaluations. Quality is value to some person; in a business setting, quality is value to some person who matters to the business. A qualitative report about a product requires us to relate the nature of the product, the people who matter, and the presence or absence of value, risks, and problems for those people. Qualitative information makes it possible for our clients to make informed decisions about quality. Level 2: To make the product story credible, tell the testing story. The testing story is about how we configured, operated, observed, and evaluated the product; what we actually did and what we actually saw. The testing story gives warrant to the product story; it helps our clients understand why they should believe and trust the product story we’re giving. 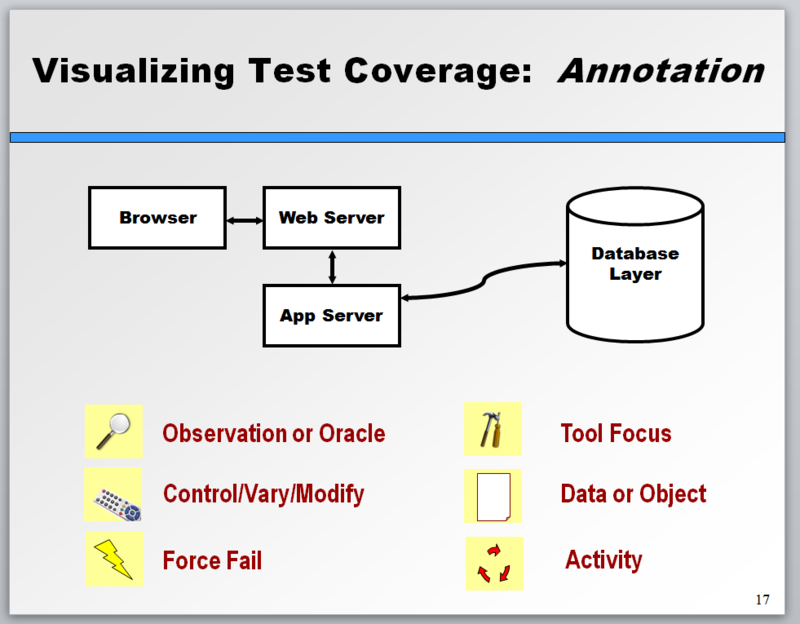 The testing story is centred around the coverage that we obtained and the oracles that we applied. Coverage is the extent to which we’ve tested the program; it’s about where we’ve looked and how we’ve looked, and it’s also about what’s uncovered—where we might not have looked yet, and where we don’t intend to look. Oracles are central to evaluation; they’re the principles and mechanisms that allow us to recognize a problem. The product story will likely feature problems in the product; the testing story, where necessary, includes an account of how we knew they were problems, for whom they would be problems, and inferences about how serious the problems it might be. We can make inferences about the significance of problems, but not ultimate conclusions, since the decision of what matters and what constitutes a problem lies with the product owner. The product story and our clients’ reactions to it will influence the ongoing testing story, and vice versa. Level 3: To make the testing story credible, tell a story about the quality of the testing. Just as the product story needs warrant, so too does the testing story. To tell a story about the quality of testing requires us to describe why the testing we’ve done has been good enough, and why the testing we haven’t done hasn’t been so important so far. The quality-of-testing story includes details on what made testing harder or slower, what made the product more or less testable, what the risks and costs of testing are, and what we might need or recommend in order to provide better, more accurate, more timely information. The quality-of-testing story will shape and be shaped by the other two stories. Headlines. A quick glance over each page tells us immediately what, in the editors’ judgement, are the most salient aspects of any given story. Headlines come in different sizes, relative to the editors’ assessment of the importance of the story. Front page. The paper comes folded. The stories that the paper deems most important to its reader are on the front page, above the fold. Other important stories are on the front page below the fold. The page is laid out to direct our attention to what we find most relevant, and to allow us to focus and refocus on items of interest. Continuation. When an entire story is too long to fit on the front page, it’s abbreviated and the story continues elsewhere. This gives the reader the option of following the story or looking at other items on the front page. Coverage areas. The newspaper is organized into sections (hard news, business, sports, life and leisure, arts, real estate, cars, travel, and so forth). Each section comes with its own front page, which generally includes headlines and continuations of its own. Structured storytelling. Newspaper stories tend to be organized in spiralling levels of detail, such that the story is set up to follow the inverted pyramid (the link is well worth reading). The story typically begins with the most newsworthy information, usually immediately addressing the five W questions—who, what where, why, and when, plus how—and the the story builds from there. The key is that the reader can absorb information to the level of detail she seeks, continuing to the end of the story or jumping out when she’s satisfied. Identifying who is involved and who is affected. Reporters and editors contextualize their stories. Just as in testing, people are the most important element of the context. A story is far more compelling when it affects the reader or people that the reader cares about. A good story often helps to clarify why the reader should care. Varying approaches to delivering information. Newspapers often use a picture to helps to illustrate or emphasize an important aspect of a story. In the business or sports sections, where quantitative data is often crucial, information may be organized in tables, or trends may be illustrated with charts. Notice that the stories—first-order reports—are always given greater prominence than the tables of stock quotes league standings, and line scores. Sidebars. Some stories are illuminated by background information that might break the flow of the main story. That information is presented in parallel; in another thread, as we might say. Daily (and in the world of the Web, continuous) delivery of information. My newspaper arrives at a regular time each day, a sort of daily heartbeat for the news cycle. The paper’s Web site is updated on a continuous basis. Information is available both on a supply and a demand basis; both when I expect it and when I seek it. Identifiable sources. Well-researched stories gain credibility by identifying how, where, when, and from whom the information was obtained. This helps to set up degrees of trust and skepticism in the reader. One important note: These approaches apply to more than text. Testers need to extend these patterns not only to written or mechanical forms, but to oral discourse. I’ll have more suggestions and additional parallels between test reporting and newspapers in the next post in this series. Exploratory testing is not “after-everything-else-is-done” testing. Exploratory testing can (and does) take place at any stage of testing or development. Indeed, TDD (test-driven development) is a form of exploratory development. TDD happens in loops, in which the programmer develops a check, then develops the code to make the check pass (along with all of the previous checks), then fixes any problems that she has discovered, and then loops back to implementing a new bit of behaviour and inventing a new check. The information obtained from each loop feeds into the next; and the activity is guided and structured by the person or people involved in the moment, rather than in advance. The checks themselves are scripted, but the activity required to produce them and to analyze the results is not. Compared to the complex cognitive activity—exploratory, iterative—that’s going on as code is being developed, the checks themselves—scripted, linear—are trivial. Requirement review is an exploratory activity too. Review of requirements (or specifications, or user stories, or examples) tends happens early on in a development cycle, whether it’s a long or a short cycle. While review might be guided by checklists, the people involved in the activity are making decisions on the fly as they go through loops of design, investigation, discovery, and learning. The outcome of each loop feeds back into the next activity, often immediately. Code review can also be done in a scripted way or an exploratory way. When humans analyze the code, it’s an unscripted, self-directed activity that happens in loops; so it is exploratory. We call it review, but it’s gathering information with the intention of informing a decision; so it is testing. There is a way to review code that involves the application of scripted processes, via a tools that people generally call “static testing tools. When a machine parses code and produces a report, by definition it’s a form of checking, and it’s scripted. Yet using those tools productively requires a great deal of exploratory activity. Parsing and interpreting the report and responding to it is polimorphic, human action—unscripted, open-ended, iterative, and therefore exploratory. Learning about a new product or a new feature is an exploratory activity if you want to do it or foster it well. Some suggest that test scripts provide a useful means of training testers. Research into learning shows that people tend to learn more quickly and more deeply when their learning is based on interaction and feedback; guided, perhaps, but not controlled. If you really want to learn about a product, try creating a mind map, documenting some aspect of the program’s behaviour, or creating plausible scenarios in which people might use—or misuse—the product. All of these activities promote learning, and they’re all exploratory activities. There’s far more information that you can use, apply, and discover than a script can tell you about. Come to think of it… where does the script come from? Developing a test procedure—even developing a test script, whether for a machine or a human to follow, or developing the kind of “test” that skilled testers would call a demonstration—is an exploratory activity. There is no script that specifies how to write a new script for a particular purpose. Heard about a new feature and pondering how you might test it? You’ve already begun testing; you’re doing test design and you’re probably learning as you go. To the extent that you use the product or interact with it, bounce ideas off other people, or think critically about your design, you’re testing, and you’re doing it in an unscripted way. Some might suggest that certain tools create scripts that can perform automatic checks. Yet reviewing those checks for appropriateness, interpreting the results, and troubleshooting unexpected outcomes are all exploratory activities. Supposing that a programmer, midway through a sprint, decides that she’d like some feedback on the work that she’s done so far on a new module. She hands you a bit of code to look at. You might interact with the code directly through a test tool that she provided, or (say) via the Ruby interpreter, or you might write some script code to exercise some of the functions in the module. In any event, you find some problems in it. In order to investigate a problem that you’ve discovered, you must explore. You must explore whether your recognition of the problem was triggered by your own interaction with the program or by a mechanically executed script. You’re in control of the activity; each new test around the problem feeds back into your choice of the next activity, and into the story that you’re going to tell about the product. All of the larger activities that I’ve described above are exploratory, and they all happen before you have a completed function or story or sprint. Exploratory testing is not a stage or phase of testing to be performed after you’ve performed your other test techniques. Exploratory testing is not an “other” test technique, because it’s not a technique at all. Exploratory testing is not a thing that you do, but rather a way that you work (and think, and act), the hallmarks being who (or what) is in control, and the extent to which your activity is part of a loop, rather than a straight line. Any test technique can be applied in a scripted way or in an exploratory way. To those who say “we do exploratory testing after our acceptance tests are all running green”, I would suggest looking carefully and observing the extent to which you’re doing exploratory testing all the way along. Should Testers Play Planning Poker? You are suggesting it may not make sense for testers to give time-based estimates to their teams, but what about relative estimates? Let’s say a Rapid Software Tester is asked to participate in Planning Poker (relative-based story estimation) on an Agile Scrum team. I’ve always considered this a golden opportunity. Are you suggesting said tester may want to refuse to participate in the Planning Poker? In any case, some fundamental problems remain: First, testing is oriented towards discovering things, not building things. At the root of it all, any estimate of how long it will take to test something is like estimating how long it will take you to evaluate someone’s ability to speak Spanish (which I wrote about here), and discovering problems in their ability to express themselves. If you already know something or can reasonably anticipate it, that helps a lot, and the Planning Poker approach (among many others) can help with that to some degree. The second problem is that there’s not necessarily symmetry between the effort in creating something and the effort in testing it. A function or feature that takes very little effort to program might take an enormous amount of effort to test. What kinds of variation could we put into data, workflow, timing, platform dependencies and interactions, scenarios, and so forth? Meanwhile, a feature that takes signficant amounts of programming effort could take almost no time to test (since “programming effort” could include an enormous amount of testing effort). There are dozens of factors involved, including the amount of testing the programmers do as they code; what kind of review is being done; what the scope of the change is; when particular discoveries get made (during “development time” or “testing time”; the skill of the parties involved; the testability of the product under test; how buggy the finished feature is (in which case there will be more time needed for investigation and reporting)… Planning Poker doesn’t solve the asymmetry problem, but it provides a venue for discussing it and getting started on sorting it out. The third problem, closely related to the second, is this idea that all testing work associated with developing something must and shall happen within the same iteration. Testing never ends; it only stops. So it’s folly to think that all testing for a given amount of programming work can always fit into the same iteration in which the work is done. I’d argue that we need a more nuanced perspective and more options than that. The decision as to how much testing we’ll need is informed by many factors. Paradoxically, we’ll need some testing to help reveal and inform our notions of how much testing we’ll need. I understand the desire to close the book on a development story within the sprint. I often—even usually—share that desire. Yet many kinds of testing work must respond to development work, and in such cases the development work has to be complete in some lesser sense than “fully tested”. Many kinds of confirmatory checking work, it seems to me, can be done within the same sprint as the programming work; no problem there. Yet it seems to me that other kinds of testing can reasonably wait for subsequent sprints—indeed, must wait for subsequent sprints, unless we’d like to have programmers stop all programming work altogether after a certain day in the sprint. Let me give you an example: in big banks, some kinds of transactions take several days to wend their way through batch processes that are run overnight. The testing work associated with that can be simulated, for sure (indeed, one would hope that most of such work would be simulated), but only at the expense of some loss of realism. For the test, whether the realism is important or not is always an open question with a fallible answer. Instead of making sure that there’s NO testing debt, consider reasonable, small, and sustainable amounts of testing debt that spans iterations. Agile can be about actual agility, instead of dogma. 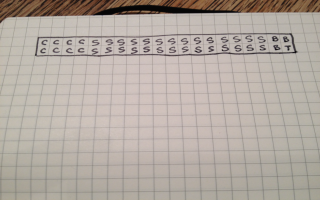 So… If playing Planning Poker is part of the context, go for it. It’s a heuristic approach to getting people to consider testing more consciously and thoughtfully, and there’s something to that. It’s oriented towards estimating things in a more comprehensible time frame, and in digestible chunks of task and effort. Planning Poker is fallible, and one approach among many possible approaches. Like everything else, its usefulness largely depends mostly on the people using it, and how they use it. I’m a tester working alone with several programmers (or one of a handful of testers working with many programmers). I’m under enormous time pressure. Builds are coming in continuously, and we’re organized on one- or two-week development cycles. The product(s) I’m testing is (are) very complex. There are many interdependencies between modules within the product, or between products. I’m seeing a consistent pattern of failures specifically related to those interdependencies; the tiniest change here can have devastating impact there—or anywhere. I believe that I have to run a complete regression test on every build to try to detect those failures. I’m trying to cope by using automated checks, but the complexity makes the automation difficult, the program’s testing hooks are minimal at best, and frequent product changes make the whole relationship brittle. The maintenance effort for the test automation is significant, at a cost to other testing I’d like to do. I’m feeling overwhelmed by all this, but I’m trying to cope. The organization in which I’m working calls itself Agile. Other than the two-week iterations, we’re actually using at most two other practices associated with Agile development, (typically) daily scrums or Kanban boards. The builds that I’m getting are very unstable. The system falls over under the most basic of smoke tests. I have to do a lot of waiting or reconfiguring or both before I can even get started on the other stuff. How might we consider these observations? We could choose to interpret them as problems for testing, but we could think of them differently: as test results. Test results don’t tell us whether something is good or bad, but they may inform a decision, or an evaluation, or more questions. People observe test results and decide whether there are problems, what the problems are, what further questions are warranted, and what decisions should be made. Doing that requires human judgement and wisdom, consideration of lots of factors, and a number of possible interpretations. Just as for automated checks and other test results, it’s important to consider a variety of explanations and interpretations for testing meta-results—observations about testing. If we don’t do that, we risk missing important problems that threaten the quality of testing effort, and the quality of the product, too. As Jerry Weinberg points out in Perfect Software and Other Illusions About Testing, whatever else something might be, it’s information. If testing is, as Jerry says, gathering information with the intention of informing a decision, it seems a mistake to leave potentially valuable observations lying around on the floor. We often run into problems when we test. But instead of thinking of them as problems for testing, we could also choose to think of them as symptoms of product or project problems—problems that testing can help to solve. For example, when a tester feels outnumbered by programmers, or when a tester feels under time pressure, that’s a test result. The feeling often comes from the programmers generating more work and more complexity than the tester can handle without help. Complexity, like quality, is a relationship between some person and something else. Complexity on its own isn’t necessarily a problem, but the way people react to it might be. When we observe the ways in which people react to perceived complexity and risk, we might learn a lot. Do we, as testers, help people to become conscious of the risks—especially the Black Swans—that typically accompany complexity? Are people reacting calmly and pragmatically? Are they acknowledging and dealing with the complexity of the product? If they can’t make the product or the process that it models less complex, are they at least taking steps to make that product or process easier to understand? Might the programmers be generating or modifying code so quickly that they’re not taking the time to understand what’s really going on with it? How might we figure that out answers to those questions? One way might be to look at more of the test results and test meta-results. Does someone perceive testing to be difficult or time-consuming? Who? What’s the basis for that perception? What assumptions underlie it? Does testing consistently reveal consistent patterns of failure? Are programmers consistently surprised by such failures and patterns? Do small changes in the code cause problems that are disproportionately large or hard to find? Do the programmers understand the product’s interdependencies clearly? Are those interdependencies necessary, or could they be eliminated? Are programmers taking steps to anticipate or prevent problems related to interfaces and interactions? If automated checks are difficult to develop and maintain, does that say something about the skill of the tester, the quality of the automation interfaces, or the scope of checks? Or about something else? Do unstable builds get in the way of deeper testing? Could we interpret “unstable builds” as a sign that the product has problems so numerous and serious that even shallow testing reveals them? When a “stable” build appears after a long series of unstable builds, how stable is it really? Perhaps, with the answers to those questions, we could raise even more questions. What risks do those problems present for the success of the product, whether in the short term or the longer term? When testing consistently reveals patterns of failures and attendant risk, what does the product team do with that information? Are the programmers mandated to deliver code? Or are the programmers mandated to deliver code with a warrant that the code does what it should (and doesn’t do what it shouldn’t), to the best of their knowledge? Do the programmers adamantly prefer the latter mandate? Is someone pressuring the programmers to make schedule or scope commitments that they can’t really fulfill? Are the programmers and the testers empowered to push back on scope or schedule pressure when it adds to product or project risk? Do the business people listen to the development team’s concerns? Are they aware of the risks that testers and programmers bring to their attention? When the development team points out risks, do managers and business people deal with them congruently? Is the team working at a sustainable pace? Or is the product and the project being overwhelmed by complexity, interdependencies, fragility, and problems that lurk just beyond the reach of our development and testing effort? Is the development team really Agile, in the sense of the precepts of the Agile Manifesto? Or is “agility” being used in a cargo-cult way, using practices or artifacts to mask over an incoherent project? Testers often feel that their role is to find, investigate, and report on bugs in a running software product. That’s usually true, but it’s also a pretty limited view of what testers could test. A product can be anything that someone has produced: a program, a requirements document, a diagram, a specification, a flowchart, a prototype, a development process mode, a development process, an idea. Testing can reveal information about all of those things, if we pay attention. When seen one way, the problems that appear at the top of this article look like serious problems for testing. They may be, but they’re more than that too. When we remember Jerry’s definition of testing as “gathering information with the intention of informing a decision”, then everything that we notice or discover during testing is a test result. This post was edited in small ways, for clarity, on 2017-03-11. 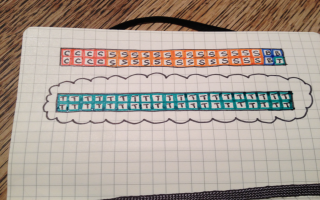 In this series of blog posts, I’ve been talking about project estimation. But I’m a tester, and if you’re reading this blog, presumably you’re a tester too, or at least you’re interested in testing. So, all this has might have been interesting for project estimation in general, but what are the implications for test project estimation? Let’s start with the tester’s approach: question the question. Is there ever such a thing as a test project? Specifically, is there such a thing as a test project that happens outside of a development project? “Test projects” are never completely independent of some other project. There’s always a client, and typically there are other stakeholders too. There’s always an information mission, whether general or specific. There’s always some development work that has been done, such that someone is seeking information about it. There’s always a tester, or some number of testers (let’s assume plural, even if it’s only one). There’s always some kind of time box, whether it’s the end of an agile iteration, a project milestone, a pre-set ship date, or a vague notion of when the project will end. Within that time box, there is at least one cycle of testing, and typically several of them. And there are risks that testing tries to address by seeking and providing information. From time to time, whether continuously or at the end of a cycle, testers report to the client on what they have discovered. The project might be a product review for a periodical. The project might be a lawsuit, in which a legal team tries to show that a product doesn’t meet contracted requirements. The project might be an academic or industrial research program in which software plays a key role. More commonly, the project is some kind of software development, whether mass-market commercial software, an online service, or IT support inside a company. The project may entail customization of an existing product, or it may involve lots of new code development. But no matter what, testing isn’t the project in and of itself; testing is a part of a project, a part that informs the project. Testing doesn’t happen in isolation; it’s part of a system. Testing observes outputs and outcomes of the system of which it is a part, and feeds that information back into the system. And testing is only one of several feedback mechanisms available to the system. Although testing may be arranged in cycles, it would be odd to think of testing as an activity that can be separated from the rest of its project, just as it would be odd to think of seeing as a separate phase of your day. People may say a lot of strange things, but you’ll rarely hear them say “I just need to get this work done, and then I’ll start seeing”; and you almost never get asked “When are you going to be done seeing?” Now, there might be part of your day when you need to pay a lot of attention to your eyes—when you’re driving a car, or cutting vegetables, or watching your child walk across a cluttered room. But, even when you’re focused (sorry) on seeing, the seeing part happens in the context of—and in the service of—some other activity. Does it make sense to think in terms of a “testing phase”? Many organizations (in particular, the non-agile ones) divide a project into two discrete parts: a “development phase” and a “testing phase”. My colleague James Bach notes an interesting fallacy there. What happens during the “development phase”? The programmers are programming. Programming may include a host of activities such as research, design, experimentation, prototyping, coding, unit testing (and in TDD, a unit check is created just before the code to be be checked), integration testing, debugging, or refactoring. Some of those activities are testing activities. And what are the testers doing during the “development phase”? The testers are testing. More specifically, they may be engaged in review, planning, test design, toolsmithing, data generation, environment setup, or the running of relatively low-level integration tests, or even very high-level system tests. All of those activities can be wrapped up under the rubric of “testing”. What happens during the “testing phase”? The programmers are still programming, and the testers are still testing. The primary thing that distinguishes the two phases, though, is the focus of the programming work: the programmers have generally stopped adding new features, but are instead fixing the problems that have been found so far. In the first phase, programmers focused on developing new features; in the second, programmers are focused on fixing. By that reckoning, James reckons, the “testing phase” should be called the fixing phase. It seems to me that if we took James’ suggestion seriously, it might change the nature of some of the questions are often asked in a development project. Replace the word “test” with the word “fix”: “How long are you going to need to fix this product?” “When is fixing going to be done?” “Can’t we just automate the fixing?” “Shouldn’t fixing get involved early in the project?” “Why was that feature broken when the customer got it? Didn’t you fix it?” And when we ask those questions, should we be asking the testers? As James also points out, no one ever held up the release or deployment of a product because there was more testing to be done. Products are delayed because of a present concern that there might be more development work to be done. Testing can stop as soon as product owners believe that they have sufficient information to accept the risk of shipping. If that’s so, the question for the testers “When are you going to be done testing?” translates to in a question for the product owner: “When am I going to believe that I have sufficient technical information to inform a risk-based business decision?” At that point, the product owner should—appropriately—be skeptical about anyone else’s determination that they are “done” testing. Now, for a program manager, the “when do I have sufficient information” question might sound hard to answer. It is hard to answer. When I was a program manager for a commercial software company, it was impossible for me to answer before the information had been marshalled. Look at the variables involved in answering the question well: technical information, technical risk, test coverage, the quality of our models, the quality of our oracles, business information, business risk, the notion of sufficiency, decisiveness… Most of those variables must be accumulated and weighed and decided in the head of a single person—and that person isn’t the tester. That person is the product owner. The evaluation of those variables and the decision to ship are all in play from one moment to the next. The final state of the contributing variables and the final decision on when to ship are in the future. Asking the tester “When are you going to be done testing?” is like asking the eyes, “When are you going to be done seeing?” Eyes will continue to scan the surroundings, providing information in parallel with the other senses, until the brain decides upon a course of action. In a similar way, testers continue to test, generating information in parallel with the other members of the project community, until the product owner decides to ship the product. Neither the tester alone nor the eyes alone can answer the “when are you going to be done” question usefully; they’re not in charge. Until it makes a decision, the brain (optionally) takes in more data which the eyes and the other sense organs, by default, continue to supply. Those of us who have ogled the dessert table, or who have gone out on disastrous dates, know the consequences of letting our eyes make decisions for us. Moreover, if there is a problem, it’s not likely the eyes that will make the problem go away. Can we estimate the duration of a “testing project” by counting “test cases” or “test steps”? Recently I attended a conference presentation in which the speaker presented a method for estimating when testing would be completed. Essentially, it was a formula: break testing down into test cases, break test cases down into test steps, observe and time some test steps, average them out (or something) to find out how long a test step takes, and then multiply that time by the number of test steps. Voila! an estimate. Only one small problem: there was no validity to the basis of the calculation. What is a test step? Is it a physical action? The speaker seem to suggest that you can tell a tester has moved on to the next step when he performs another input action. Yet surely all input actions are not created equal. What counts as an input action? A mouse click? A mouse movement? The entry of some data into a field? Into a number of fields, followed by the press of an Enter key? Does the test step include an observation? Several observations? Evaluation? What happens when a human notices something odd and starts thinking? What happens when, in the middle of test execution, a tester recognizes a risk and decides to search for a related problem? What happens to the unit of measurement when a tester finds a problem, and begins to investigate and report it? The speaker seemed to acknowledge the problem when she said that a step might take five seconds, or half a day. A margin of error of about 3000 to one per test step—the unit on which the estimate is based—would seem to jeopardize the validity of the estimate. Yet the margin of error, profound as it is, is orthogonal to a much bigger problem with this approach to estimation. Excellent testing is not the monotonic or repetitive execution of scripted ideas. (That’s something that my community calls checking.) Instead, testing is an investigation of code, computers, people, value, risks, and the relationships between them. Investigation requires loops of exploration, experimentation, discovery, research, result interpretation, and learning. Variation and adaptation are essential to the process. Execution of a test often involves reflecting on what has just happened, backtracking over a set of steps, and then repeating or varying the steps while posing different questions or making observations. An investigation cannot follow a prescribed set of steps. Indeed, an investigation that follows a predetermined set of steps is not an investigation at all. If we can’t estimate by counting test cases, how can we estimate how much time we’ll need for testing? There are plenty of activities that don’t yield to piecework models because they are inseparable from the project in which they happen. In another of James Bach’s analogies, no one estimates the looking-out-the-window phase of driving an automobile journey. You can estimate the length of the journey, but looking out the window happens continuously, until the travellers have reached the destination. Indeed, looking out the window informs the driver’s evaluation of whether journey is on track, and whether the destination has been reached. No one estimates the customer service phase of a hotel stay. You can estimate the length of the stay, but customer service (when it’s good) is available continuously until the visitor has left the hotel. For management purposes, customer service people (the front desk, the room cleaners) inform the observation that the visitor has left. No one estimates the “management phase” of a software development project. You can estimate how long development will take, but management (when it’s good) happens continuously until the product owner has decided to release the product. Observations and actions from managers (the development manager, the support manager, the documentation manager, and yes, the test manager) inform the product owner’s decision as to whether the product is ready to ship. So it goes for testing. Test estimation becomes a problem only if one makes the mistake of treating testing as a separate activity or phase, rather than as an open-ended, ongoing investigation that continues throughout the project. My manager says that I have to provide an estimate, so what do I do? At the beginning of the project, we know very little relative to what we’ll know later. We can’t know everything we’ll need to know. We can’t know at the beginning of the project whether the product will meet its schedule without being visited by a Black Swan or a flock of Black Cygnets. So instead of thinking in terms of test estimation, try thinking in terms of strategy, logistics, negotiation, and refinement. Our strategy is the set of ideas that guide our test design. Those ideas are informed by the project environment, or context; by the quality criteria that might be valued by users and other stakeholders; by the test coverage that we might wish to obtain; and by the test techniques that we might choose to apply. (See the Heuristic Test Strategy Model that we use in Rapid Testing as an example of a framework for developing a strategy.) Logistics is the set of ideas that guide our application of people, equipment, tools, and other resources to fulfill our strategy. Put strategy and logistics together and we’ve got a plan. Since we’re working with—and, more importantly, for—a client, the client’s mission, schedule, and budget are central to choices on the elements of our strategy and logistics. Some of those choices may follow history or the current state of affairs. For example, many projects happen in shops that already have a roster of programmers and testers; many projects are extensions of an existing product or service. Sometimes project strategy ideas based on projections or guesswork or hopes; for example, the product owner already has some idea of when she wants to ship the product. So we use whatever information is available to create a preliminary test plan. Our client may like our plan—and she may not. Either way, in an effective relationship, neither party can dictate the terms of service. Instead, we negotiate. Many of our preconceptions (and the client’s) will be invalid and will change as the project evolves. But that’s okay; the project environment, excellent testing, and a continuous flow of reporting and interaction will immediately start helping to reveal unwarranted assumptions and new risk ideas. If we treat testing as something happens continuously with development, and if we view development in cycles that provide a kind of pulse for the project, we have opportunities to review and refine our plans. So: instead of thinking about estimation of the “testing phase”, think about negotiation and refinement of your test strategy within the context of the overall project. That’s what happens anyway, isn’t it? But my management loves estimates! Isn’t there something we can estimate? metrics whose purposes are to determine how much time is spent on test design and execution (activities that yield test coverage) vs. bug investigation and reporting, and setup (activities that interrupt the generation of test coverage). Let’s also assume that a development cycle is two weeks, or ten working days—the length of a typical agile iteration. Let’s assume that we have four testers on the team, and that each tester can accomplish three sessions of work per day (meetings, e-mail, breaks, conversations, and other non-session activities take up the rest of the time). Let’s assume further that sessions cannot be completely effective, in that test design and execution will be interrupted by setup and bug investigation. Suppose that we reckon 10% of the time spent on setup, and 25% of the time spent on investigating and reporting bugs. That’s 35% in total; for convenience, let’s call it 1/3 of the time. Thus in our two-week iteration we estimate that we have time for 80 focused, targeted effective idealized sessions of test coverage, embedded in 120 actual sessions of testing. Again, this is not a precise figure; it couldn’t possibly be. If our designers and programmers have done very well in a particular area, we won’t find lots of bugs and our effective coverage per session will go up. If setup is in some way lacking, we may find that interruptions account for more than one-third of the time, which means that our effective coverage will be reduced, or that we have to allocate more sessions to obtain the same coverage. So as soon as we start obtaining information about what actually went on in the sessions, we feed that information back into the estimation. I wrote extensively about that here. On its own, the metrics on interruptions could be fascinating and actionable information for managers. But note that the metrics on their own are not conclusive. They can’t be. Instead, they inform questions. Why has there been more bug investigation than we expected? Are there more problems than we anticipated, or are testers spending too much time investigating before consulting with the programmers? Is setup taking longer than it should, such that customers will have setup problems too? Even if the setup problems will be experienced only in testing, are there ways to make setup more rapid so that we can spend more time on test coverage? The real value of any metrics is in the questions they raise, rather than in the answers they give. There’s an alternative approach, for those who want to estimate the duration or staffing for a test cycle: set the desired amount of coverage, and apply the fixed variables and calculate for the free ones. Break the product down into areas, and assign some desired number of sessions to each based on risk, scope, complexity, or any combination of factors you choose. Based on prior experience or even on a guess, adjust for interruptions and effectiveness. If you know the number of testers, you can figure the amount of time required; if you want to set the amount of time, you can calculate for the number of testers required. This provides you with a quick estimate. Which, of course, you should immediately distrust. What influence does tester experience and skill have on your estimate? On the eventual reality? If you’re thinking of adding testers, can you avoid banging into Brooks’ Law? Are your notions of risk static? Are they valid? And so forth. Estimation done well should provoke a large number of questions. Not to worry; actual testing will inform the answers to those questions. Wait a second. We paid a lot of money for an expensive test management tool, and we sent all of our people to a one-week course on test estimation, and we now spend several weeks preparing our estimates. And since we started with all that, our estimates have come out really accurate. If experience tells us anything, it should tell us that we should be suspicious of any person or process that claims to predict the future reliably. Such claims tend to be fulfilled via the Ludic Fallacy and the narrative bias, central pillars of the philosophy of The Black Swan. Since we already have an answer to the question “When are we going to be done?”, we have the opporutunity (and often the mandate) to turn an estimate into a self-fulfilling prophecy. Jerry Weinberg‘s Zeroth Law of Quality (“If you ignore quality, you can meet any other requirement“) is a special case of my own, more general Zeroth Law of Wish Fulfillment: “If you ignore some factors, you can achieve anything you like.” If your estimates always match reality, what assumptions and observations have you jettisoned in order to make reality fit the estimate? And if you’re spending weeks on estimation, might that time be better spent on testing?